First it has been noticed that Technical Consultants are never happy with the quality of the Functional Specification (FS). The way I make an FS will be explained in this blog. 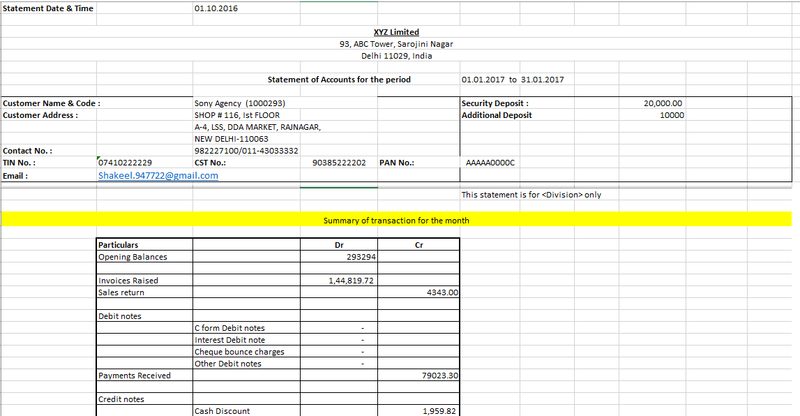 I have taken an example of complex customised which is for detailed ‘Customer Account Statement’ report. I had developed this form/report for one of the clients in India during S/4 HANA Implementation. Secondly I remember early 2009 I had asked someone to share one FS so that I can learn how it is written. I just want to give back the same to someone else. If it helps to one my purpose is achieved. Cheers! One must make a standard FS Template which shall be used throughout the project for RICEFW (Report, Interfaces, Conversion, Enhancement, Forms, Workflow). (Here attachment can not be given so giving the screen shots). This is very detailed output for Customer Account Statement. Business Requirement Section: Customer account statement is sent to customers periodically for reconciliation purposes. Object Logic for Input and Output is written in this section. This is the most important section of the FS. Column E = It take care where authorization object need to be taken care. 9 Statement Date & Time SYST-DATUM & Time Default Date as system date and time. Column C = Logic for each field in column B. There are 129 fields in the output for which logic to be built. It is to be developed in PDF and exportable in Excel as well. All outer cells shall be aligned irrespective of no. of columns in every box. Business Approval Section: FS must be signed off by business before releasing to technical consultant. Well I disagree with the technical information on a functional specification. Of course I do it all FS, Unit test, Integration testing, and customer testing. I have however been just a functional person and just a technical person. “JUST” <smile>. Both jobs do a lot of work, and have to know a lot. There is actual code in here. I could write the program faster than putting all the code in the FS. When I got one of these as a technical programmer half of the time it wasn’t correct. Rather than argue with the functional person, I just wrote what was needed and let them test it. Thus making the functional spec wrong. Writing code in the spec is a number one – don’t do it. BTW – some of the functional people were not easy to work with when looking at their code. I could debate with them for days. That’s why I finally just did what I knew was correct. But it depending on the company. Sometimes I just did what the functional spec said to do. Waited and had my code ready to fix it after the customer testing. At least the second way the functional spec was correct. Where is the logic for what the steps where before the program.? Customer did ABC transaction and then wrote something down then did DEF, and then… I need that information to be able to really test this. If I’m not familiar with the module that information is critical. If I am it is less critical, but still nice to have. What user base is this being used for? People who know the system, people who rarely are on the system. That gives me a place to know how detailed that text must be. For example, if I use material / plant will they understand it? Or should I use Product (the description) and location (the plant). I did agree with your sections. I also would like the end user sign off. They can’t do that with the way this is written. One of my favorite tools for interactive programs is build. I haven’t had much time to explore it. But the tool is amazing. BTW – if this is written for the technical people as well as the functional people, you might want to add them in the tag. It would be interesting to hear from them all. Well, I am a FICO consultant and it took me one and half hour to prepare this FS. If it is code, how you would you explain what data to be filtered out in FS? With your words it seems you are a technical (ABAPER) consultant and you have bad experience with people specially when it’s about FS. You are welcome anyways. Cheers!